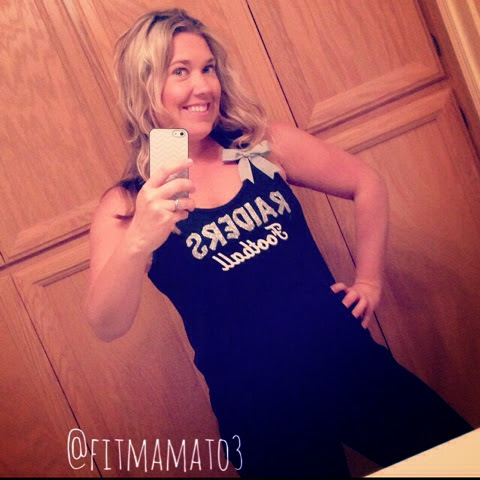 A big giant thank you to Vanessa at www.ruffleswithlove.com for sending me this amazing workout shirt to review. This was a custom order, but she has so many cute shirts ready to go. I am wearing a medium razor back. I asked for the bow to be on the side, but I realized it's a pin so I can easily remove it for washing or so put it on the razor back which would be super cute too! I love my shirt, it's light weigh, but still a great quality fabric. I can't wait to get another one. Thank you Ruffles With Love and GO RAIDERS!!! !